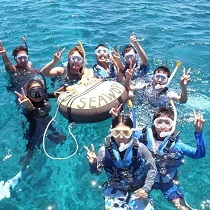 This snorkel tour only takes 3 hours and the boat leaves from Naha. 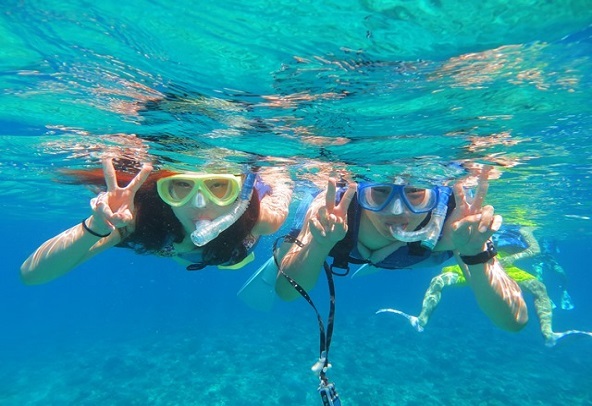 It's a short trip ideal for people with limited time to spare, and for those that want to combine it with sightseeing on Kokusai street.You swim together with an instructor after taking a short lesson, making this a trip that even beginners can enjoy. 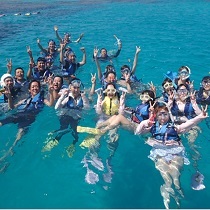 Snorkel and enjoy water sports at an untouched spot only reachable by boat. 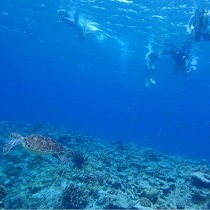 With tropical fish and coral reefs that spread out in front of you, you are guaranteed to be both excited and moved. *6 years old and over. *6 years old or older / Healthy person. *Pregnant women and those suffering from serious medical conditions are unable to participate. *The car park at the port where we meet is a pay and display car park. Please make sure you have money for parking. *4 years old and over. Snorkeling is for children of elementary age and over. *Being in good health is a requirement for participation. *Reservations must be made at least 3 days in advance. Reservation from the site of Sea World or over phone available.